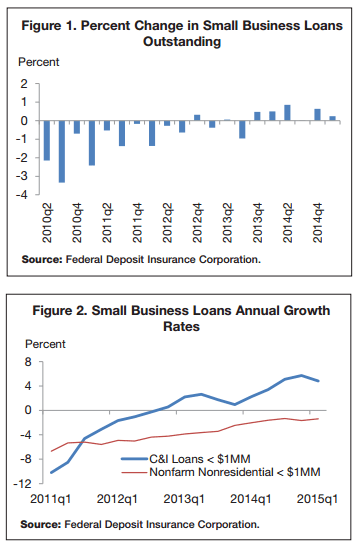 Small business borrowing conditions continued to improve gradually in the first quarter of 2015. For example, the percent change in small business loans outstanding (in amounts of $1 million or less) remained positive or unchanged for the sixth consecutive quarter (Figure 1). Small business loans outstanding totaled $595 billion and remained relatively flat from the previous quarter, but year-over-year (Q1 2014 to Q1 2015) showed an increase of 1.7 percent. Both commercial industrial (C&I) and commercial real estate (CRE) loans make up small business loans. A careful look at these loans shows that they continue to indicate progress in capital availability for small businesses. The FDIC reports small business loans in three loan size categories for both C&I and CRE loans: loans under $100,000, $100,000 – $250,000, and $250,001 – $1 million. The smallest size of small business commercial industrial loans outstanding (under $100,000) grew by 1.1 percent relative to the last quarter in 2014. Loans in this size category have grown by 11.6 percent from their lowest point, $118 billion in the third quarter of 2011.